Woo hoo! We found a great new restaurant that you will like, and that’s what Chow is all about. At the Pilot House Restaurant, you can see the east end of the Cape Cod Canal from pretty much every seat. A step down here, a couple of steps up there, and you get a multi-level extravaganza of entertaining views. Of course, Gina and the Big Dog sat at the bar, where you get peeks of sparkly water but not much else in terms of view. We did get to see an excellent golf tournament on TV, and we had a great view of the Pilot House’s excellent selection of unusual wines. We don’t usually dwell on the alcohol, but let us do that for a moment. We ordered two glasses of Cabernet Sauvignon in order to compare them: one Justin, which we had only ever seen by the bottle at The Rye Tavern in Plymouth, and a Josh Cellars, which the Big Dog gets at The Lobster Trap in nearby Pocasset (and which we just realized we’ve never mentioned). Lucky Gina got the $12 Justin, and the Big Dog got the $8 Josh. Both were rich, lush Cabs, full of fruit but not jammy, but when it came time to order a second glass we decided that the distinction wasn’t worth $4, and we ordered another pair of Joshes. We note that a Chardonnay drinker beside us was delighted to see a La Crema on the wine list, but balked at the $11 pricetag. Lucky for her, apparently, her blustery male companions insisted ordered the La Crema over her objections. We’re sure that you could order soup, salad, and entrees at the Pilot House, and maybe a dessert, and enjoy them all. But do what we did, and you’ll be just as happy. 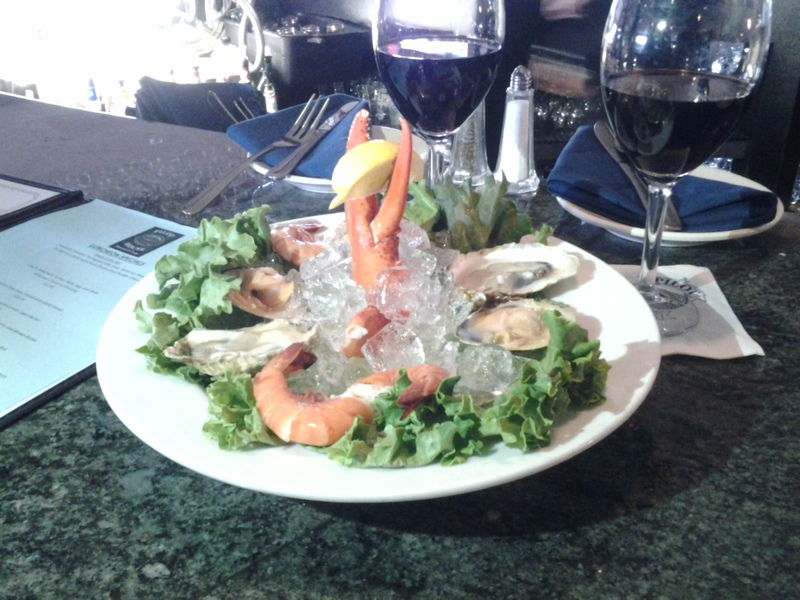 To start, we ordered the cold seafood sampler ($15.95). It came with a lobster claw, two oysters, two littlenecks, and four peel-and-eat shrimp. We don’t share the same taste in seafood, and this was a perfect arrangement, with us each getting plenty of the stuff we like. The platter came with plastic cups of horseradish, cocktail sauce, and a vinegar concoction that Patricia the bartender explained was “minuet sauce — some people like it with their oysters.” The oysters were from Barnstable, we learned, and everything was clean and crisp and fresh. We then ordered a haddock chowder special ($5.95) and blackened swordfish with lemon caper butter special ($12.95). We informed Patricia that we intended to split both, and she facilitated that with extra spoons and plates. The chowder was outstanding. We don’t mean it was good. We mean that if we do a chowder contest: sorry, kids, but we’re picking the Pilot House. We mean that if we’re marooned on a desert island, the one food we want with us is Pilot House chowder. We mean that if we’re elected president, this soup will be served in the White House. We mean… well, you get the picture. We all have our pet peeves about chowder: too thick, too thin, potatoes too big, insufficient protein, etc., but we dare you to find something wrong with this creamy, bacony, thyme-y bowl of bliss. The salad was a very fresh lettuce mix with some added oomph — maybe brussels sprouts leaves? — with grape tomatoes, a few European cucumber slices, some red onion, and the best house-made Italian dressing we have ever tasted. No need to tart up this basic oil and vinegar emulsion with herbs or cheese. The swordfish was good. The butternut squash served alongside was also good. The mashed potatoes were fluffy, smooth, and delicious. The Pilot House isn’t new. The building has clearly been there for a long time, although the interior has a fresh updated feel, and the operators tout some significant experience in the area. It was new to us, though, and we look forward to returning for outdoor dining as the weather warms.